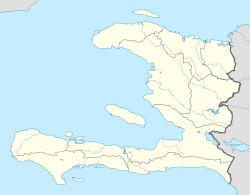 Port-Salut is a coastal commune in the Sud department of Haiti. Port-Salut is a popular destination for local Haitians as well as tourists due to the surrounding beaches. The area has yet to be discovered on a mainstream tourist level. Port-Salut is the hometown of Haiti's former president, Jean-Bertrand Aristide, who was born there in 1953 and is also hometown of former Prime Minister Jean-Marie Cherestal. ^ "National Geospatial-Intelligence Agency". GeoNames Search. Retrieved 1 September 2014. ^ "IHSI" (PDF). INSTITUT HAÏTIEN DE STATISTIQUE ET D’INFORMATIQUE. Retrieved 1 September 2014.